Next stop: Ryan and Hannah's wedding. Peak hour commuters got to witness a marriage proposal on their way to Flinders Street Station this morning. 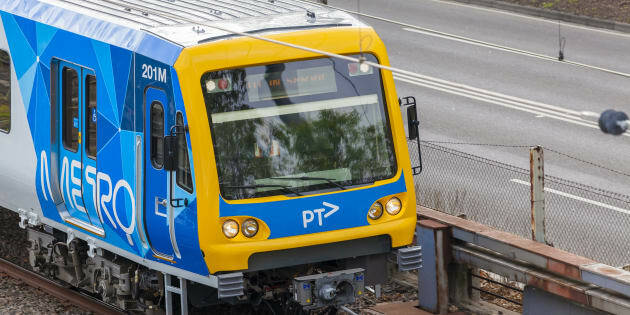 Love was in the air in the fourth carriage of a train on Melbourne's Frankston Line on Friday morning when commuter Ryan popped the question to his girlfiend Hannah. The two lovebirds met on a train 10 years ago, so it made sense that Ryan would enlist the help of Metro Trains to propose to Hannah as the pair made their way to Flinders Street station. "We have two of our regular commuters with us today, Hannah and Ryan. They met on the train about 10 years ago, they have been madly in love ever since and today Ryan has a special question he'd like to ask Hannah," the train driver announced to those on board. Without hesitation, Ryan managed to get down on one knee on the crowded train and propose (spoiler alert: she said yes). We're thrilled that you choo choo choose each other. Wishing you a long life of happiness and love together. Next stop: the wedding!